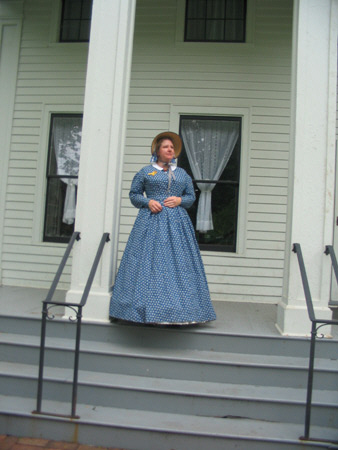 The first dress I did for Naperville in 2005 was a simple blue cotton print day dress because I wasn't sure how I would like this time period. It turned out fine, but not terribly exciting....but it's a blue cotton day dress so what did I expect? For this year (2006), I wanted to get a little bit more sophisticated so I found a more interesting bodice design and dived into my fabric stash for something interesting in the way of fabric. I found a very light wool, almost a gauze in a tiny grey and dark grey check. I did a button front with a brooch at the neck which was a very typical look in period. The buttons are black so you can see that in spite of the dark appearance for the dress, it's not actually black. I did a 'coat' style sleeve which was also very common in period, not a cutting edge fashion but very practical. And now the full effect with bonnet and paisley style shawl I picked up on my last trip to London. For the evening, I made myself a changeable taffetta ballgown in tseal and black. My friend Sheila gave me a blackand red lace fan which inspired me to put a few touched of red into it just to spark it up a bit. The Victorians were big on fake flowers with their ballgowns so I made a corsage and headpiece to go with the black/green/accented with red theme. And what am I wearing under all that Mid-Victorian splendor? Custom made Mid-Victorian underpinnings, of course!